The official date and venue for the Greyhound Board of Great Britain (GBGB) awards gala has been released. Looks like the Greyhound Board of Great Britain have had to find yet another venue to congratulate themselves for exploiting greyhounds throughout the year & we will be right there to hold them to account. Once again the venue is in London but this time it's at the Park Plaza. 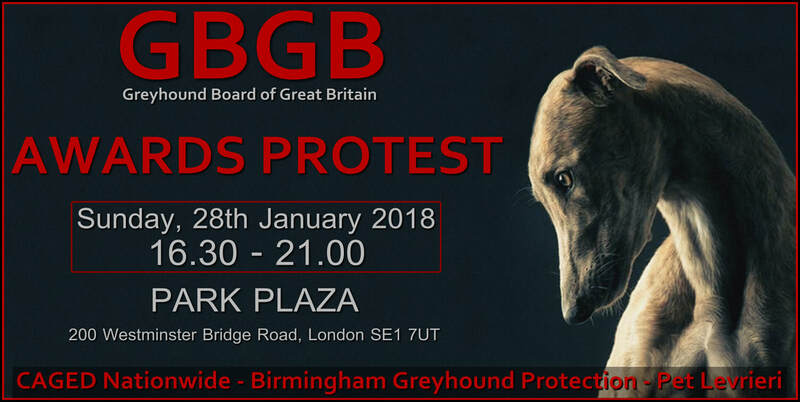 CAGED Nationwide, Birmingham Greyhound Protection & Pet Levrieri are hoping you join us once again for the annual GBGB awards protest.